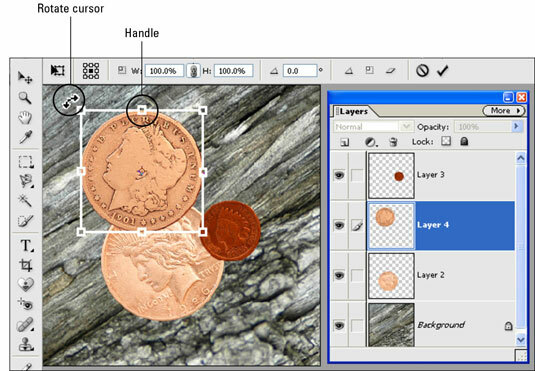 1Choose Windows→Layers to display the Layers palette. In Elements, each pasted selection appears on its own layer. 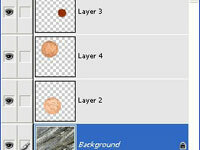 2Click the name of the pasted selection’s layer in the Layers palette. 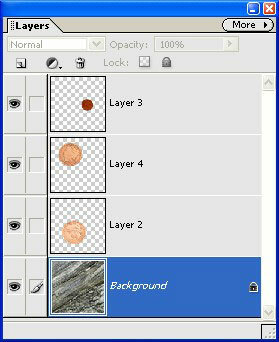 This step makes the layer active. 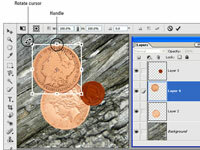 3To move a pasted object, select the Move tool and turn off the Auto Select Layer box on the options bar; then, drag the element in the image window. While the Move tool is active, you also can press the arrow keys on your keyboard to nudge the element. 4Rotate a pasted element by first choosing Image→Transform→Free Transform or pressing Ctrl+T (command+T on a Mac). A square bounding box appears around the layer contents. Little boxes — called handles — appear around the perimeter of the boundary. 5Move your mouse outside a corner handle to display the curved rotate cursor, then drag up or down to spin the layer. Drag outside a transformation handle to rotate the contents of a layer. 6Click the Commit button to finalize the rotation. To cancel a transformation, press the Esc key or click the Cancel button. 7To resize a pasted element, select the Maintain Aspect Ratio button on the options bar, then drag the transformation handles. Resizing an element can lead to poor image quality. This step completes the resizing. 9Flip the pasted element by choosing Image→Rotate→Flip Layer Horizontal or Flip Layer Vertical. Your image flips as instructed.